All vangas are essentially active seekers after exposed or hidden invertebrate or vertebrate prey. In line with bill form, the species can be separated into three basic groups—gleaners, predators/substrate strippers, and other species. The gleaners include the smaller Calicalicus and Hypositta species, which take small insect prey from substrates, the latter genus directly from trunks and large branches while moving in the manner of a nuthatch. The Calicalicus vangas glean from leaves and twigs. Blue vangas have quite conical-shaped bills that they use to extract insects from the tips of narrow canopy branches. Even longer and more conical is the bill of Chabert's vanga, which is used as a gleaning instrument in the canopy as well as for catching flying insects, particularly around flowers. Ty-las vangas take larger invertebrates such as caterpillars from leaves. The heavy-billed vangas (Pollen's, Van Dam's, Lafres-naye's, rufous, white-headed, Bernier's, and hook-billed) exploit the mass of their bills to great advantage. The Xenopirostris vangas (Van Dam's, Pollen's, and Lafresnaye's) are capable of breaking off bits of dead branch, levering off mats of moss adhering to branches, opening insect cocoons, and crunching up heavily armored Gasteracantha spiders. The longer and more raptor-like bill of the hook-billed vanga is used for tearing apart small vertebrates, often through the use of a horizontal tree-fork in which to wedge the prey. Chameleons, bats, geckos, frogs, and even other birds are dealt with in this way. Rufous vangas eat rather similar kinds of food, but hunt for it in a different way. They spot prey by its movement, and so the actual species eaten are very different from those consumed by the hook-billed vanga. The Rufous vanga takes cockroaches, scorpions, and ants from the forest floor, and katydids and beetles from the undersides of understory leaves. The white-headed vanga, having a rather less substantial bill than the latter species, is more of a generalist, and while quite capable of killing and eating small chameleons, will also occasionally take fruit. Blue and Chabert's vangas have also been recorded eating fruits. 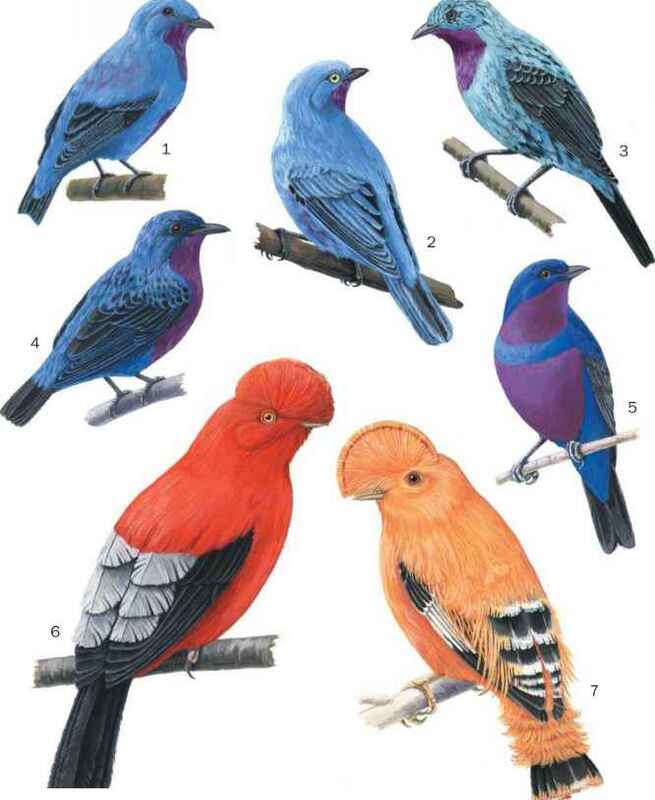 The Bernier's vanga uses its triangular-shaped bill to dig into rotting masses of vegetation, especially those in the bases of Pan-danus trees, from which it then energetically flings debris in search for invertebrates. The two odd-billed species (sicklebilled vanga and helmet vanga) provide an object lesson in the interpretation of structural adaptation. For sicklebills, the bills are used as one might predict, to probe deeply into holes and recover well-hidden invertebrate larvae. The long powerful neck of this species is a great advantage in twisting the bill around curves in holes. By contrast, the helmet vanga uses its remarkable bill for little more than crunching up medium-sized invertebrates. It often displays great dexterity in sally-gleaning some invertebrate from a leaf or branch in a manner very similar to a rufous vanga, and likewise takes much prey from the ground.